As of January 1, 2018, specific reimbursement for pathogen inactivated platelets is now available in Germany. This reimbursement enables German blood centres to produce Pathogen Inactivated platelets, and hospitals to administer safer platelet concentrates to their patients with limited budgetary concerns. A large German multi-centre study has demonstrated bacterial contamination rates of 1/1.169 apheresis platelets and 1/1.544 buffy-coat platelets. In a recent published study from the German Red Cross on Routinely screened platelets at the end of day 3, 1/2.886 platelet concentrates tested positive for bacteria. While emerging pathogens are not seen as an immediate concern in Germany a recent study showed a significant impact on temporary donor deferrals and how this puts additional pressures on the continuity of the blood supply. The percentages of donors which are temporarily deferred due to “infection risk related to travel history” has grown from approximately 5 to 10% between 2010 and 2015, and only 18% of those temporarily deferred donors come back for a donation. Germany, after France, is the second major European nation which has decided over the last 12 months to address current safety concerns with platelet transfusions. 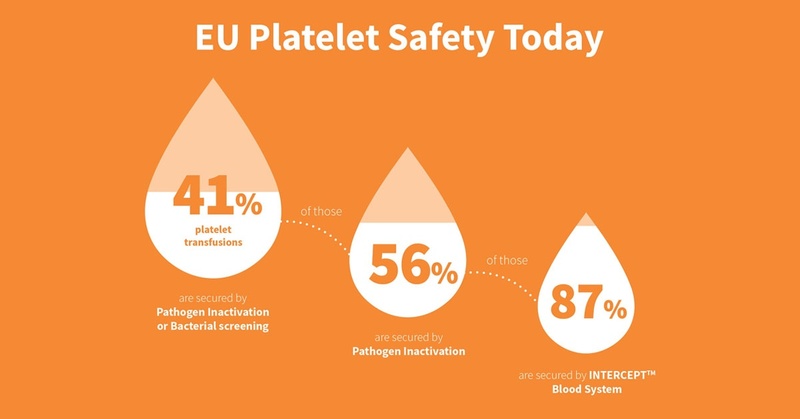 Today ~40% of platelets in Europe are secured by pathogen inactivation or bacterial screening, and of those over 50% are secured by pathogen inactivation. The INTERCEPT™ Blood System is by far the most used pathogen inactivation system in Europe, representing >87% of pathogen inactivated platelets treated today. INTERCEPT is currently the only approved pathogen inactivation system for platelets in Germany. Since 2007, multiple German blood centres have received approval from the Paul-Ehrlich-Institute to manufacturer INTERCEPT treated platelets. France, Switzerland, Belgium, Iceland, Kuwait, and Qatar have decided to inactivate 100% of their produced platelets. The number of secured platelet concentrates in Europe will possibly grow significantly with the decision for reimbursement in Germany. Represents EU December 2017 market size data provided by national, regional, and individual blood centres. Data on file.